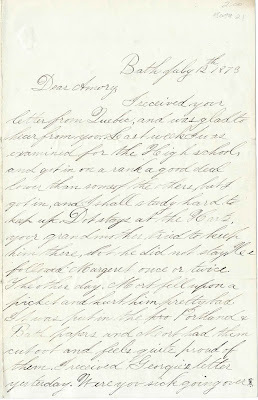 July 12, 1873 letter from young George H. Patten, "Georgie", to his friend Amory McLellan Houghton, who had previously written to George from Quebec, while presumably on a voyage with his father, sea captain John Reed Houghton. 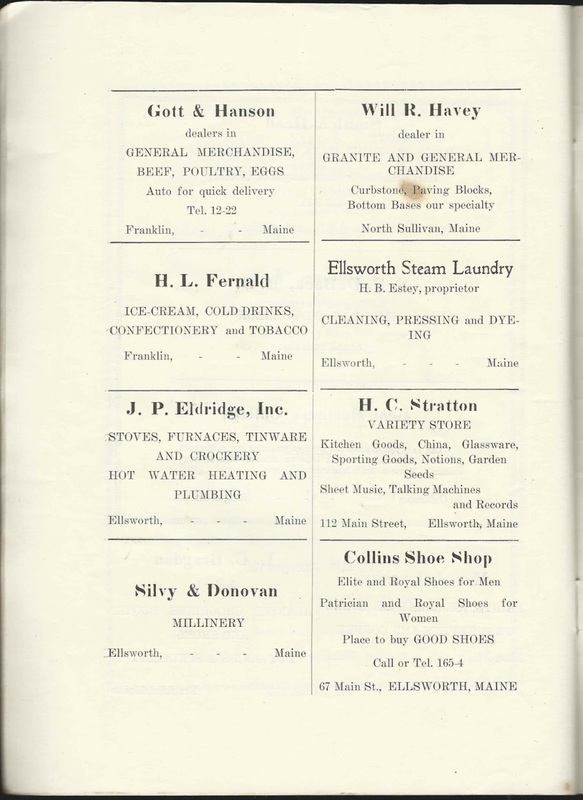 The Pattens and Houghtons were seafaring and shipbuilding families from the Bath, Maine, area. 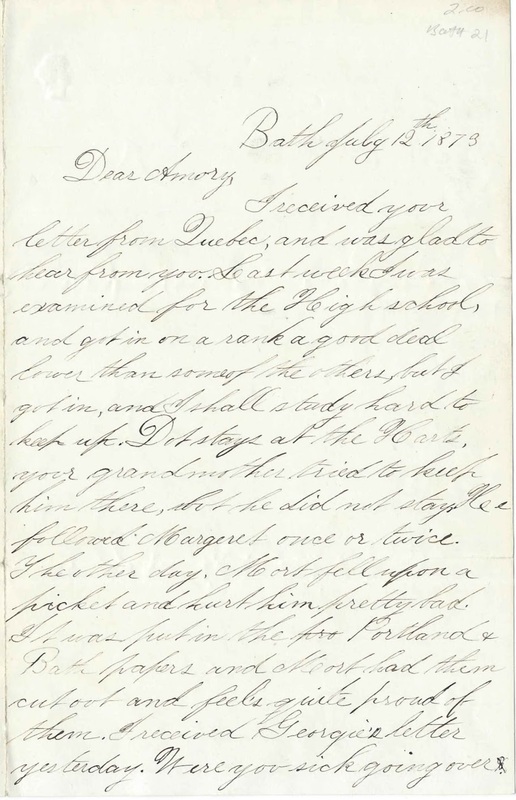 See another letter written to Amory on this same day by John Owen Patten, perhaps a cousin of George H. Patten, who may have been the Georgie mentioned in John's letter. 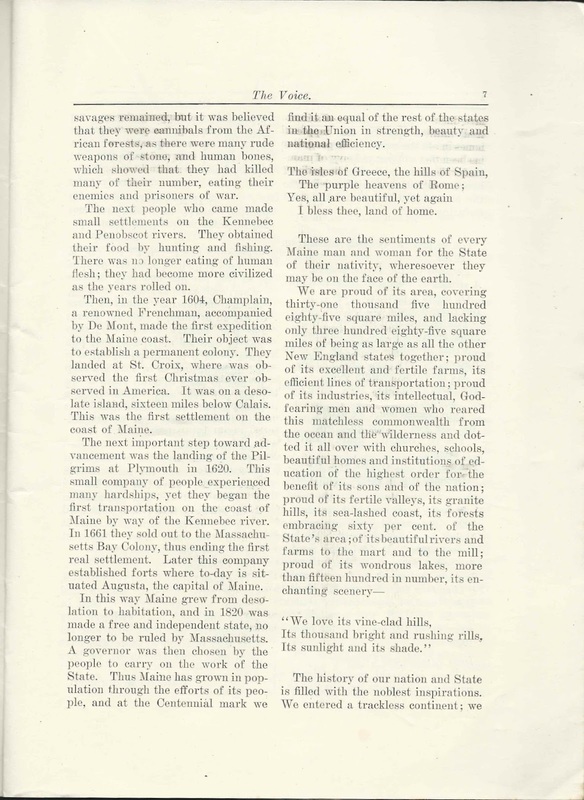 Read more about the ancestors of the Patten family in midcoast Maine here. 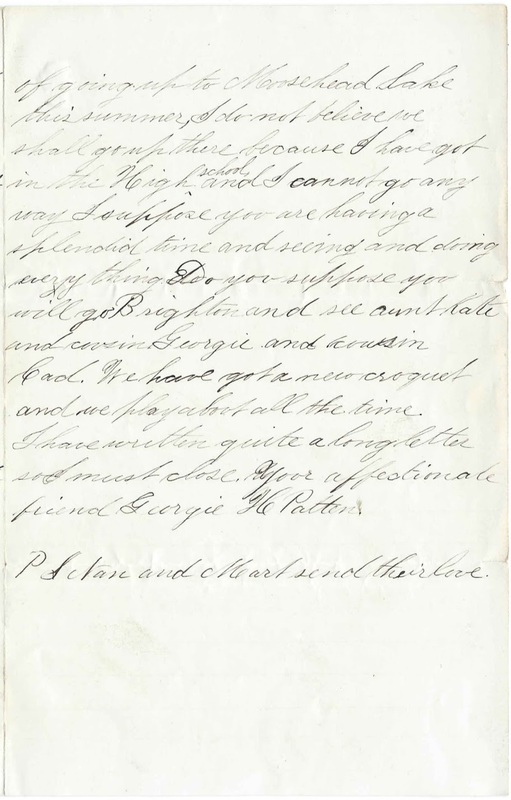 See images of the panes of Georgie's letter, which you can enlarge by clicking on them, and a transcript at the end of this post. 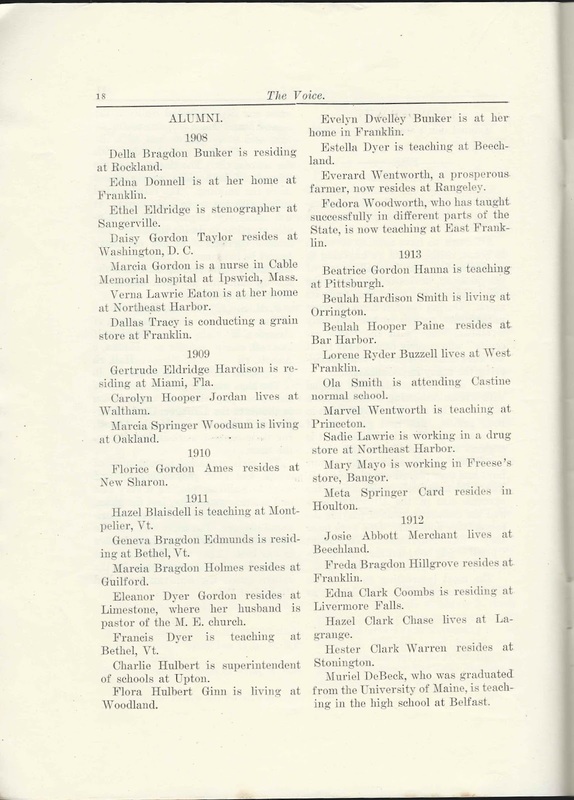 George H. Patten, "Georgie", mentions a sad event, the recent drowning of August Morse and Bertie Anderson, who had borrowed a boat from Ned Sewall [presumably Edward Sewall, the father or more likely his son]. Their bodies were found at Harrington's wharf. 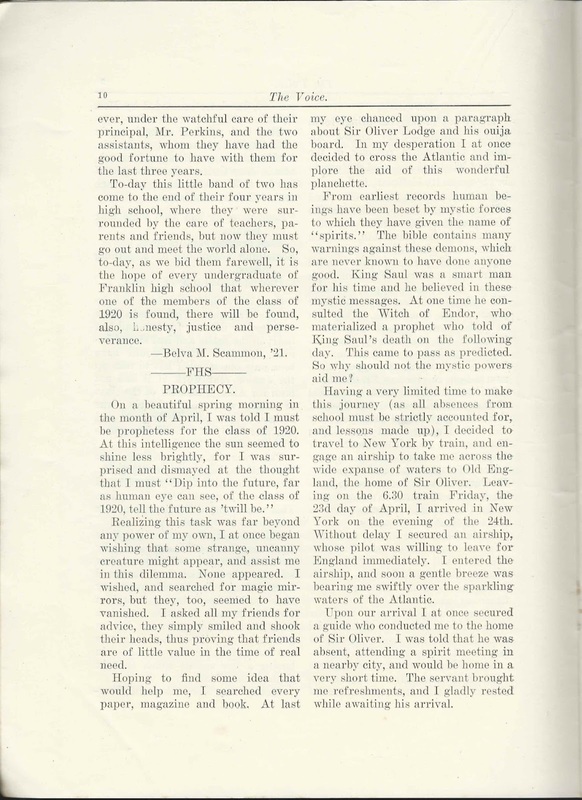 Johnnie noted that speculation was that Bertie had fallen overboard and that August drowned trying to save Bertie. 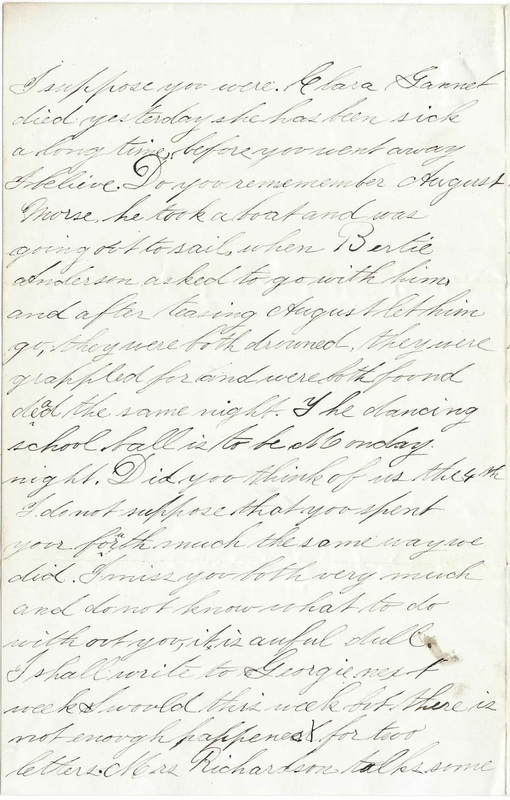 From an article in the New York Clipper, issue of July 19, 1873: the boys were Augustus Andre Morse, age 9, son of Captain Warren Morse, and Herbert Maxwell Anderson, "Bertie", age 4, son of Dr. Samuel Anderson. 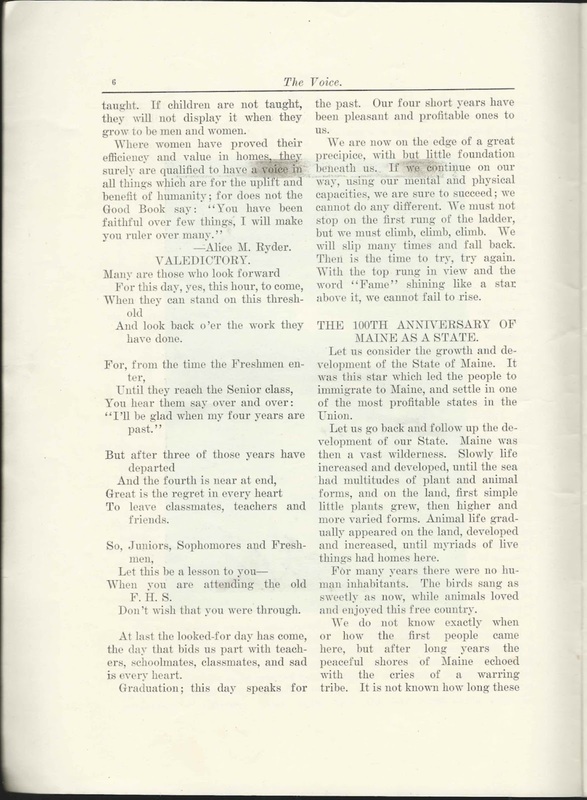 George H. Patten was born May 12, 1860 in Maine, the son of George M. and Fredericka (Camp) Patten. He served in the U.S. Army and attained the rank of captain and was injured in the line of duty. He died in 1832 and is buried in the Maple Grove Cemetery with other members of the Patten family. Amory McLellan Houghton was born October 11, 1859 at Bath, Maine, the son of ship builder John Reed Houghton and Emma P. (McLellan) Houghton. 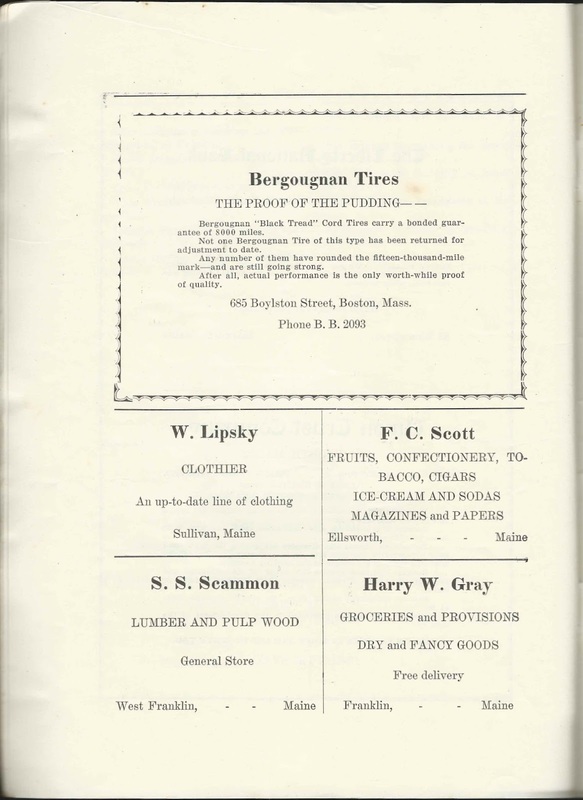 Amory's mother was also from a shipbuilding family; her father, James Henry McLellan, owned a large fleet at Bath, Maine. The Maine Maritime Museum has items of dress she wore at her wedding to John Reed Houghton; they can be seen here. 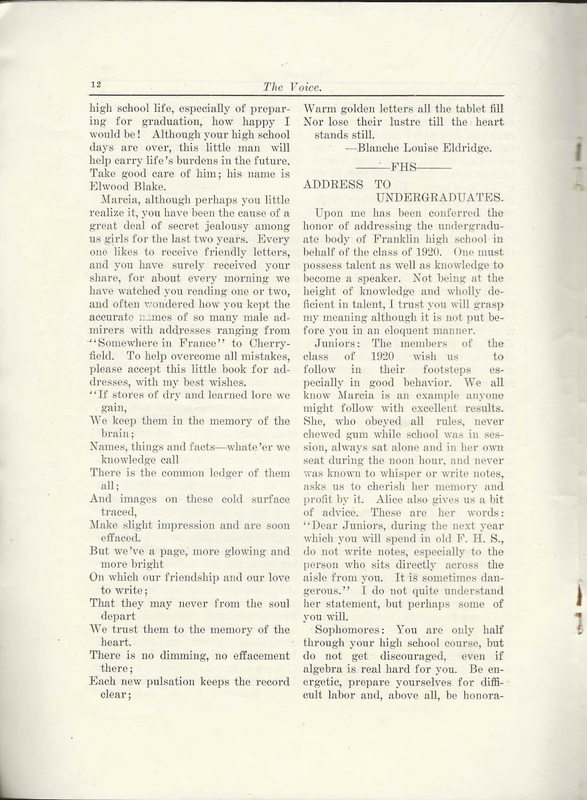 The information describing the items mentions that Emma died in childbirth when Amory was seven years old. 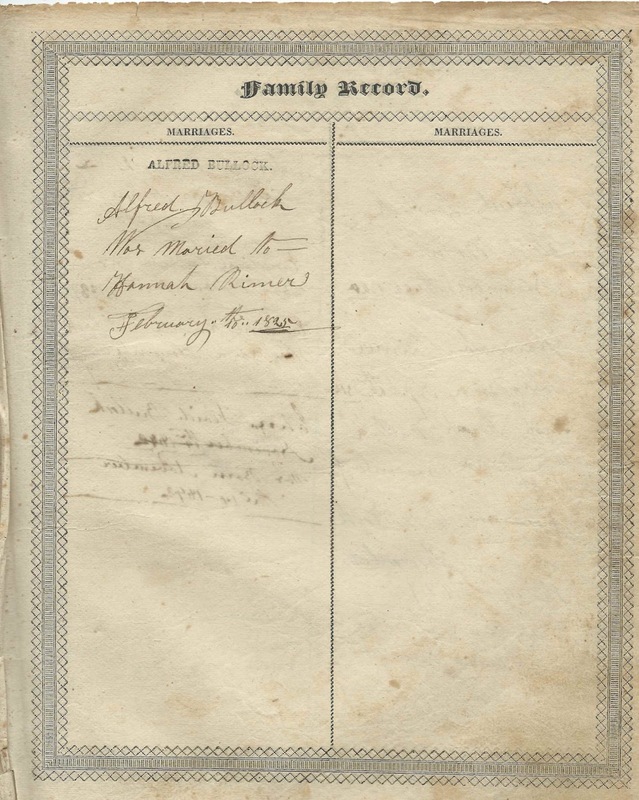 On March 11, 1890, Amory married Jane McIlvaine, "Jenny", at Philadelphia, Pennsylvania. 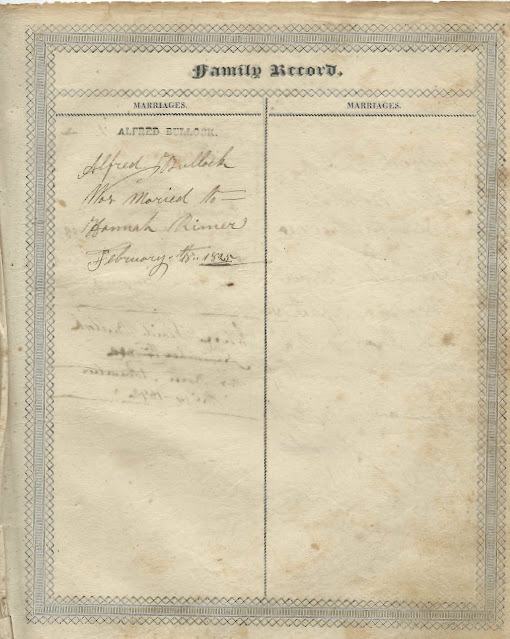 Amory and Jennie lived at Bath, Maine, and had three children, a daughter and two sons. In 1892 Amory applied for a passport, along with Sydney J. Meeker, with the intention of going to Cuba, presumably for business. 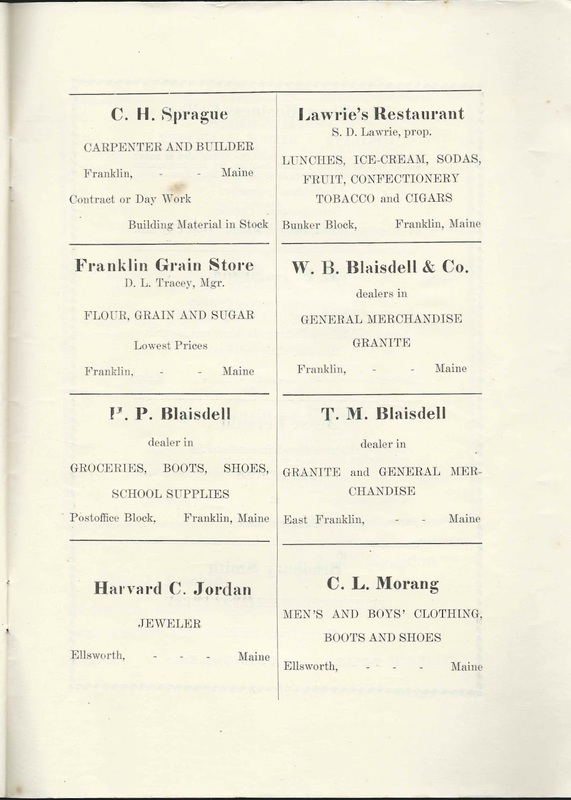 On the 1910 Census, Amory listed his occupation as "salt dealer", and on later censuses as a merchant. 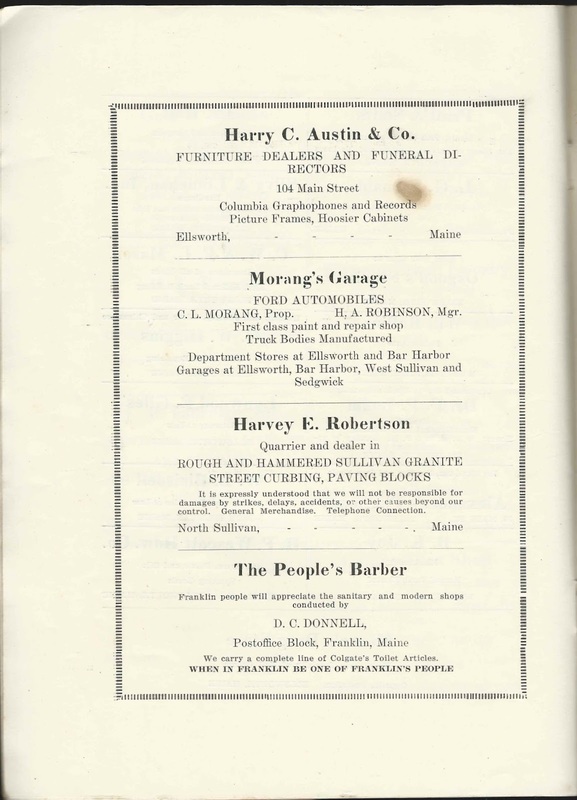 He died in 1926 at Bath, Maine; he and his wife, who died in 1945, are buried at Maple Grove Cemetery at Bath, Maine. I received your letter from Quebec and was glad to hear from you. Last week I was examined for the High school, and got in on a rank a good deal lower than some of the others, but I got in, and I shall study hard to keep up. Dot stays at the Harts, your grandmother tried to keep him there, but he did not stay. He followed Margeret once or twice. The other day Mort fell upon a picket and hurt him pretty bad. It was put in Portland & Bath papers and Mort had them cut out and feels quite proud of them. 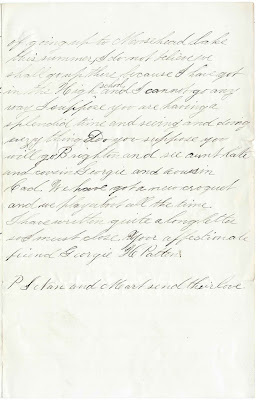 I received Georgie's letter yesterday. Were you sick going over? I suppose you were. Clara Gannet died yesterday. She has been sick a long time before you went away, I believe. Do you remember August Morse? He took a boat and was going out to sail when Bertie Anderson asked to go with him and after teasing August let him go, they were both drowned. They were grappled for and were both found dead the same night. 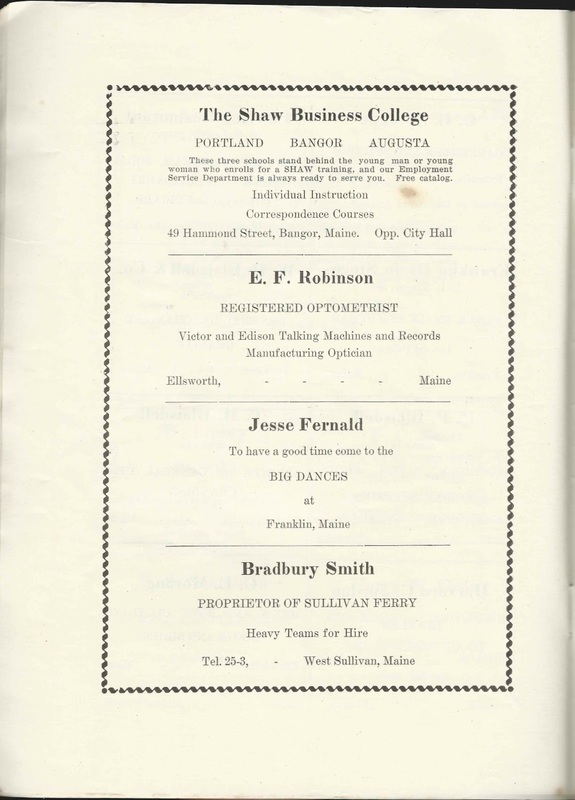 The dancing school ball is to be Monday night. Do you think of us the 4th? I do not suppose that you spent your fourth much the same way we did. I miss you both very much and I do not know what to do without you. It is awful dull. I shall write to Georgie next week. I would this week but there is not enough happens for two letters. Mrs. Richardson talks some of going to Moosehead Lake this summer. I do not believe we shall go up there because I have got in the High school and I cannot go any way. I suppose you are having splendid time and seeing and doing everything. Do you suppose you will go Brighton and see Aunt Kate and cousin Georgie and cousin Cad. We have got a new croquet and we play about all the time. 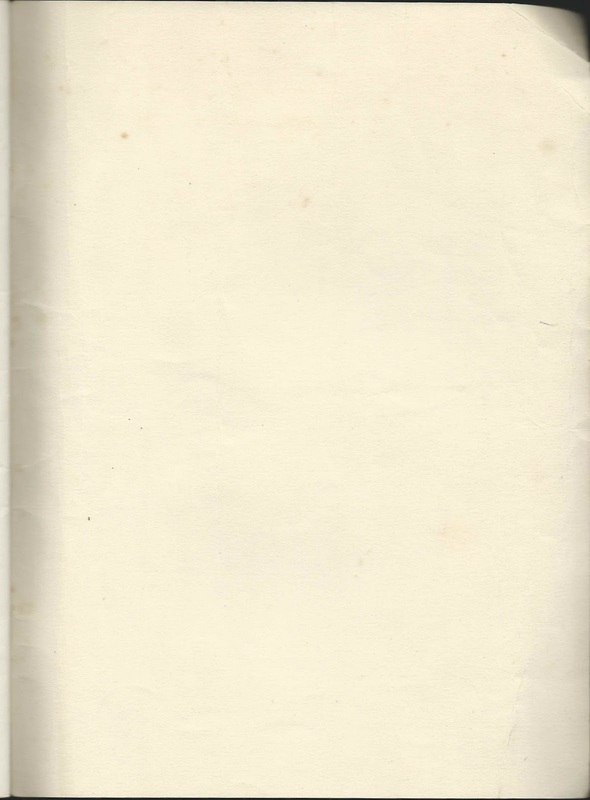 I have written quite a long letter so I must close. 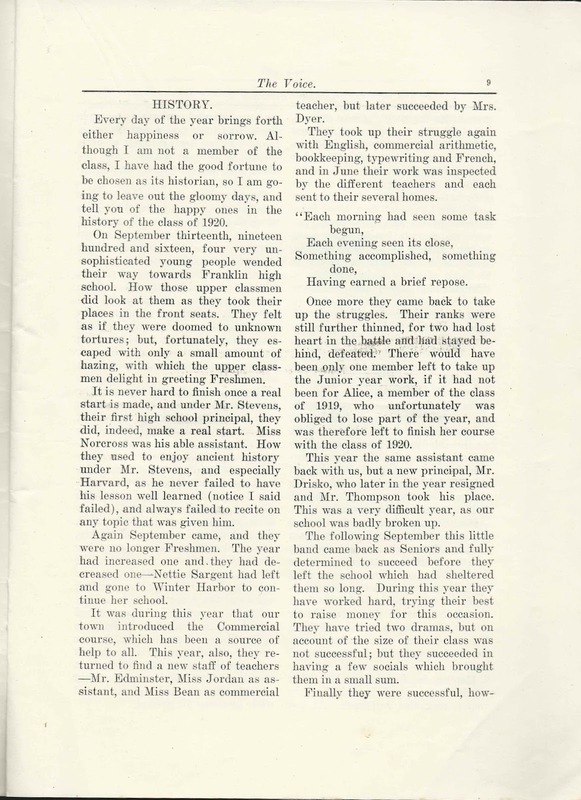 Your affectionate friend Georgie H. Patten. P.S. Nan and Mort send their love. Photograph, taken on September 11, 1908, of Theodore Saunders Peirce of Milford, New Hampshire, at the age of 10 months. 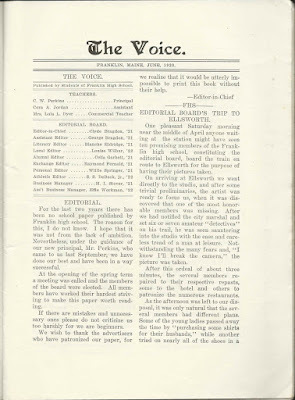 Theodore Saunders Peirce was born November 11, 1907 in Hillsborough County, New Hampshire, the son of William E. and Harriet Plummer (Saunders) Peirce of Milford, New Hampshire; they were born in Manchester, New Hampshire, and Waterford, Maine, respectively. 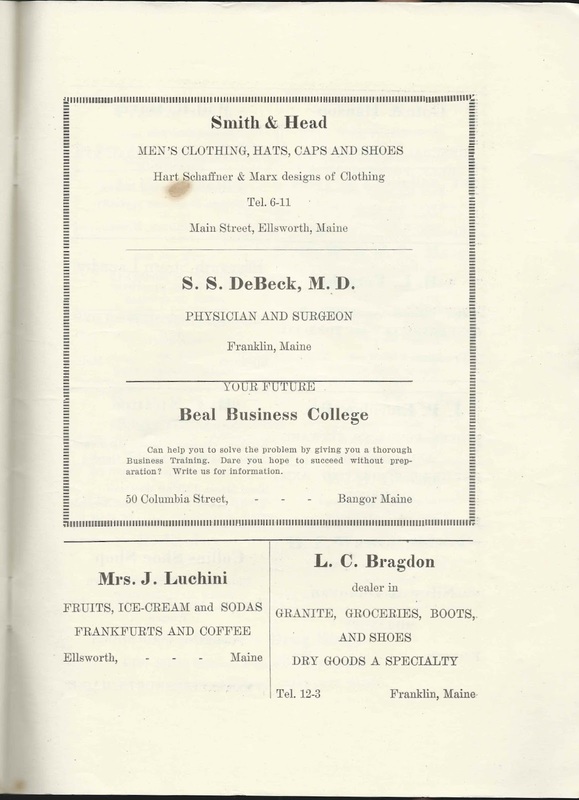 Theodore attended Dartmouth College and worked in the insurance industry. 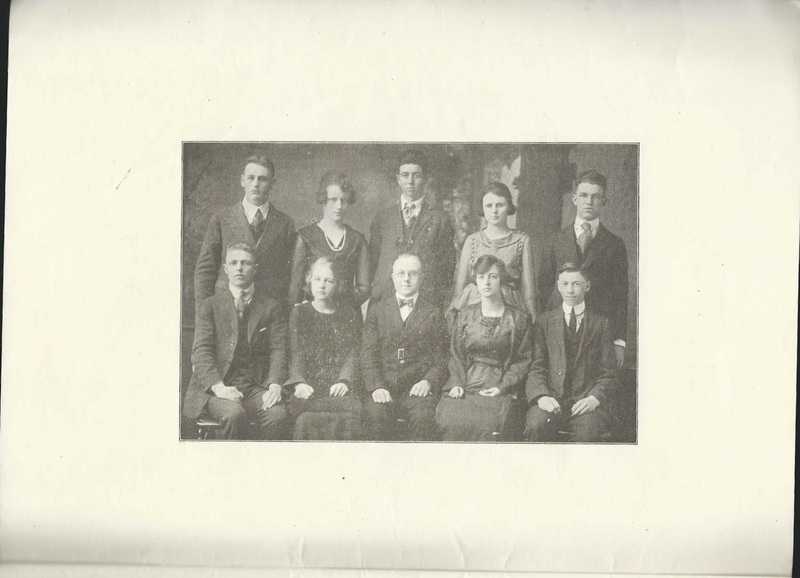 I believe it was after 1930 that he married Dorothy Murphy, born in Northern Ireland, the daughter of James Richard Murphy and Eleanor (McCance) Murphy. Theodore died in 1961 and is buried in the Murphy plot at the Riverside Cemetery at Grafton, Massachusetts. 5"x7" photograph of a home, identified on the reverse as the home of Eliza Sampson at Hanson, Massachusetts, "birthplace of Julia Marion and I. Lewis Tillson". 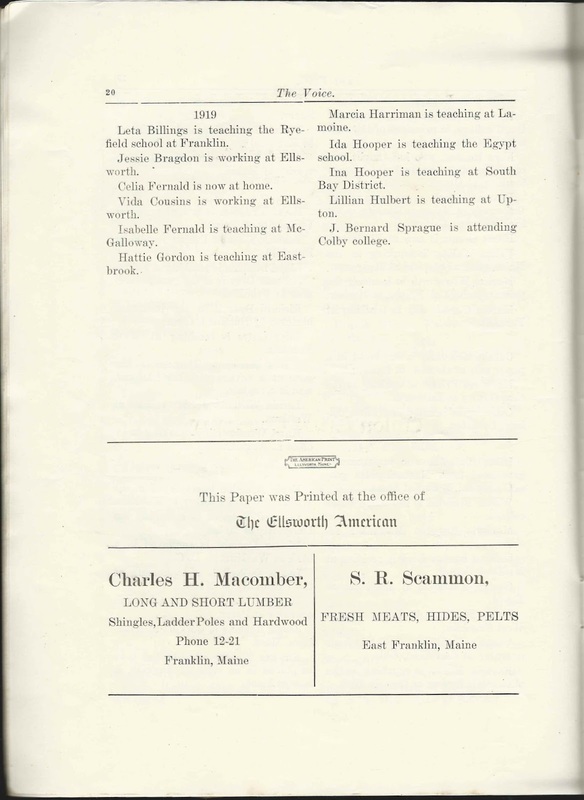 I believe the homeowner was Eliza T. Sampson, born June 14, 1842 at Pembroke, Massachusetts, the daughter of Turner and Eunice Sampson. Eliza's mother died in 1852 and her father, with whom she made her home, in 1893. Eliza herself, apparently having never married, died in 1923 and is buried with her parents at Mount Zion Cemetery at Whitman, Massachusetts. Julia Marion Tillson and Isaiah Lewis Tillson were the children of Isaiah Newton Tillson and Julia Anna (Peterson) Tillson. Julia Marion Tillson, or Marion Julia Tillson, was born November 16, 1871, at Hanson, Massachusetts; she would marry Chester S. Hale. Sadly, she died young, on August 30, 1891 at Whitman, Massachusetts. 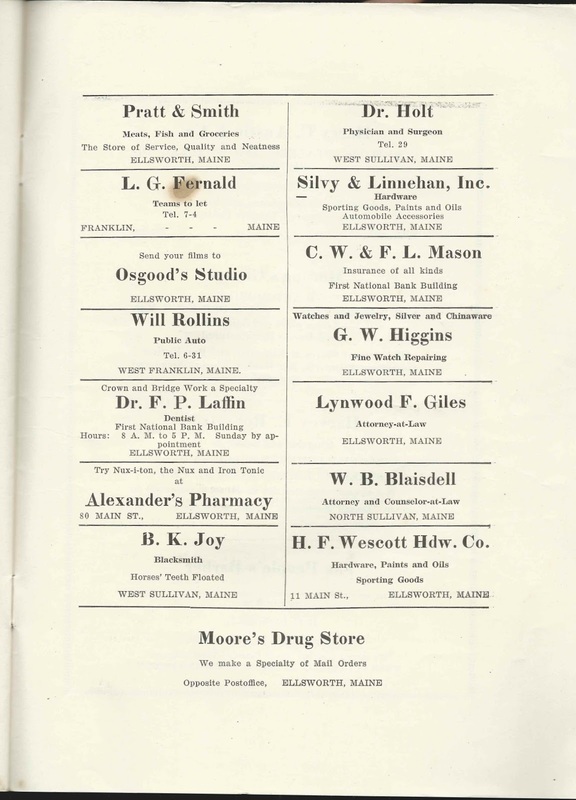 Isaiah Lewis Tillson was born July 18, 1874 at Hanson, Massachusetts. Isaiah Lewis Tillson married twice: in 1898 he married Nellie Maria Drury, with whom he had, I believe, six children; and about 1924 he married Harriet Elizabeth Westgate. 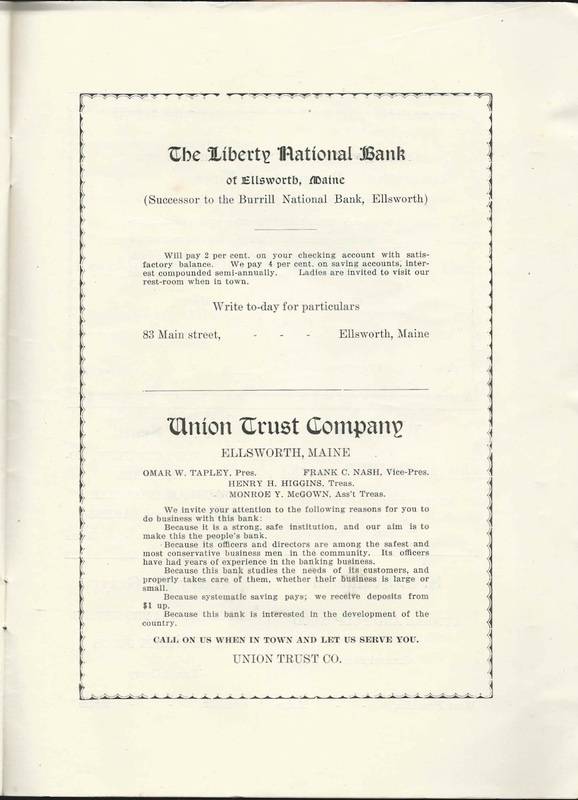 Isaiah Lewis Tillson died Mary 10, 1955 at Hanson, Massachusetts. Oversized matted photographs of two young adults identified on the reverse as John B. Dyer and Minnie Reed Dyer, presumably not long before or after their marriage of June 21, 1905 at Augusta, Maine. John's photograph was taken at the J. V. Footman studio at Augusta, Maine. 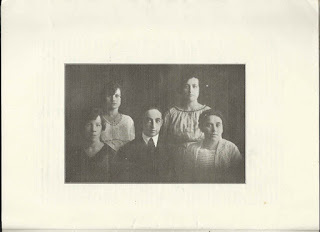 Minnie's photograph was taken at the Manning studio at Fitchburg, Massachusetts. Matted, the photographs measure 13-1/2" by 8-1/2" and are rather heavy. 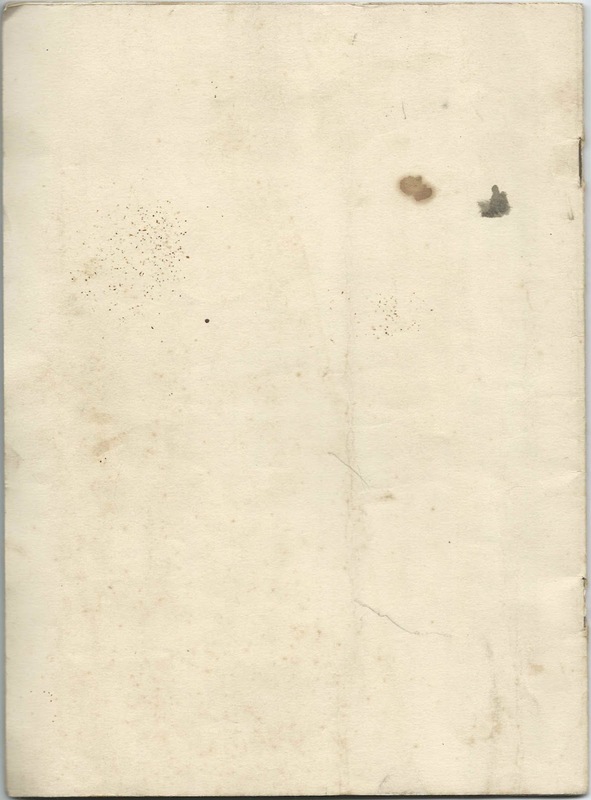 The photographs themselves measure about 9-1/4" by 4-1/4". Apparently the antique booth seller placed a high value on the woman's style, as her photograph was $15; her husband's was only $6. I felt the price for the two combined was reasonable, so I bought them both to keep them together. 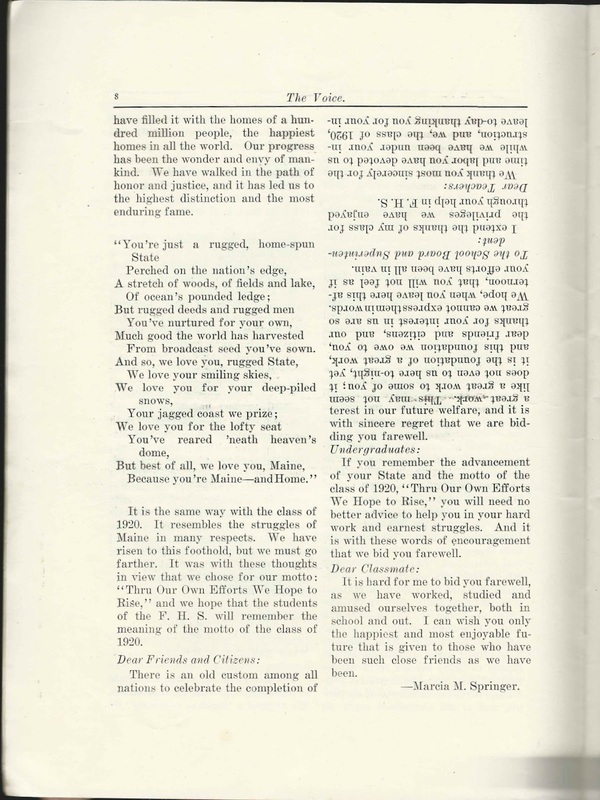 John Burton Dyer was born September 15, 1878 at Augusta, Maine, the son of Leslie A. Dyer and Marie L. (Anderson) Dyer, who were born at Augusta, Maine, and Hallowell, Maine, respectively. 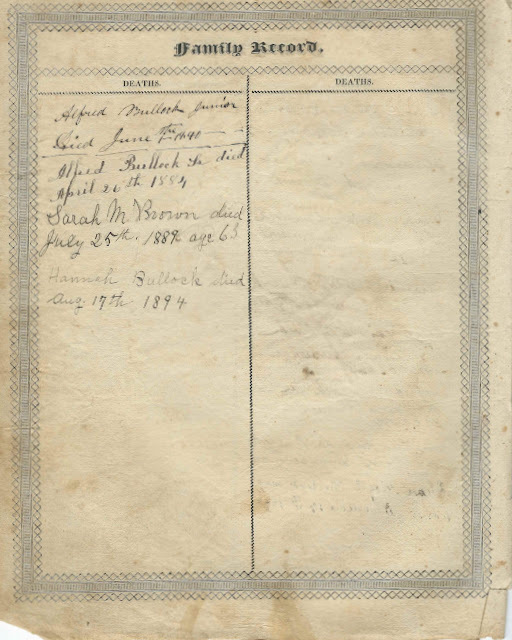 On June 21, 1905, at Augusta, Maine, John Burton Dyer married Minnie Rebecca Reed, daughter of Fred George Reed and Julia (Walker) Reed, who were both Benton, Maine, natives. Minnie was born about May 1881 at Benton, Maine. 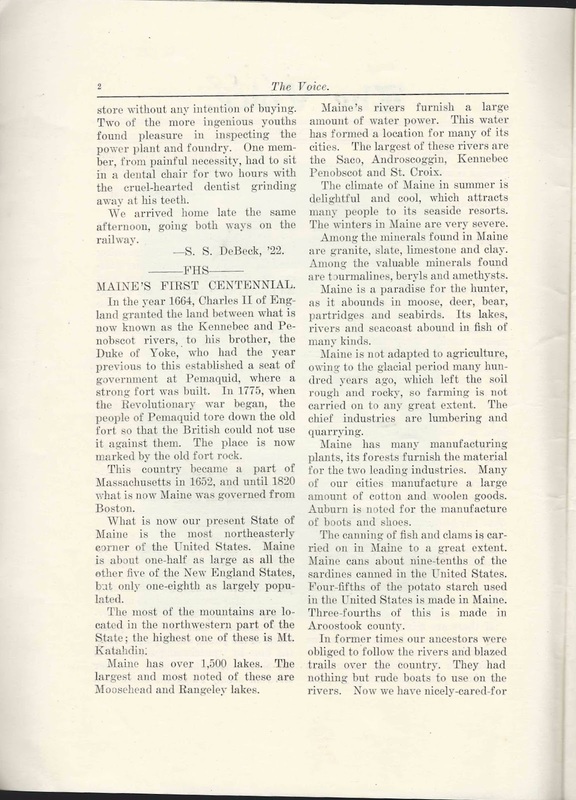 The new couple lived in various places in Maine, including Portland, Bangor and Augusta, Maine. 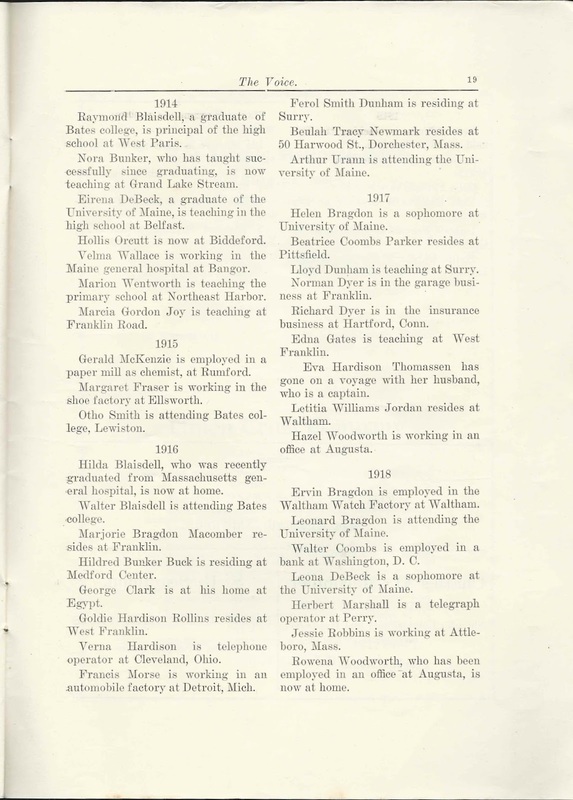 They had at least one child, a son John Reed Dyer, born in 1918 at Bangor, Maine. Minnie died in 1960, and I believe her husband John had predeceased her in 1959. Circa 1880 cabinet photograph of a young woman identified on the reverse as either Mary Heitmann or Mary Heilmann. The photograph was taken at the De Young studio at 815 Broadway, New York, New York. If you recognize this woman from your family albums or research, please leave a comment or contact me directly with her family history information. 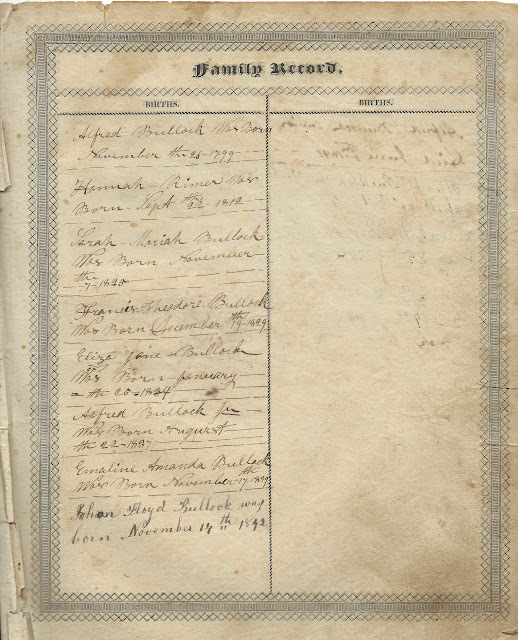 Section of a Bible with Family Record pages containing information on the family of Alfred Bullock and wife Hannah (Rimer) Bullock, who were married on February 10, 1825. 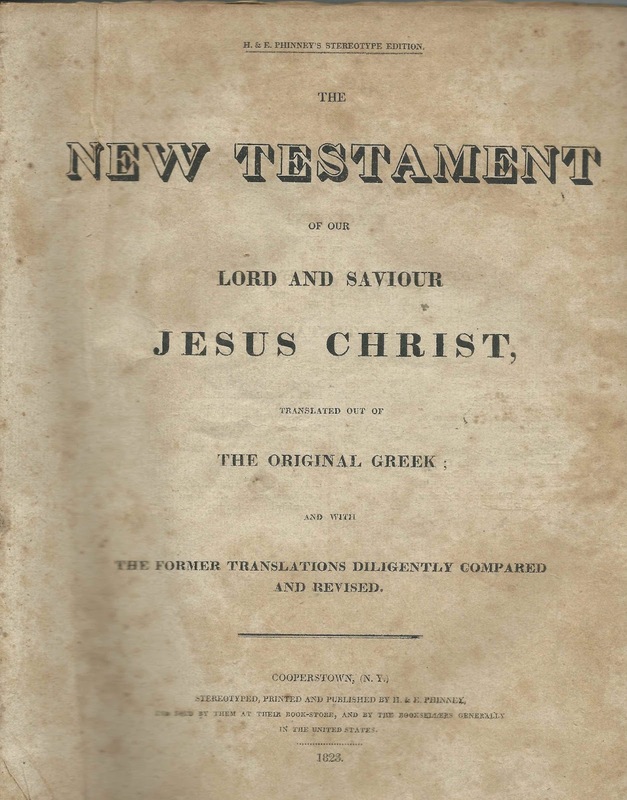 The Bible is approximately 10-3/4" by 8-1/2" inches and was published in Cooperstown, New York, in 1823. The section still with the Records pages measures a bit over a 1/2" thick. 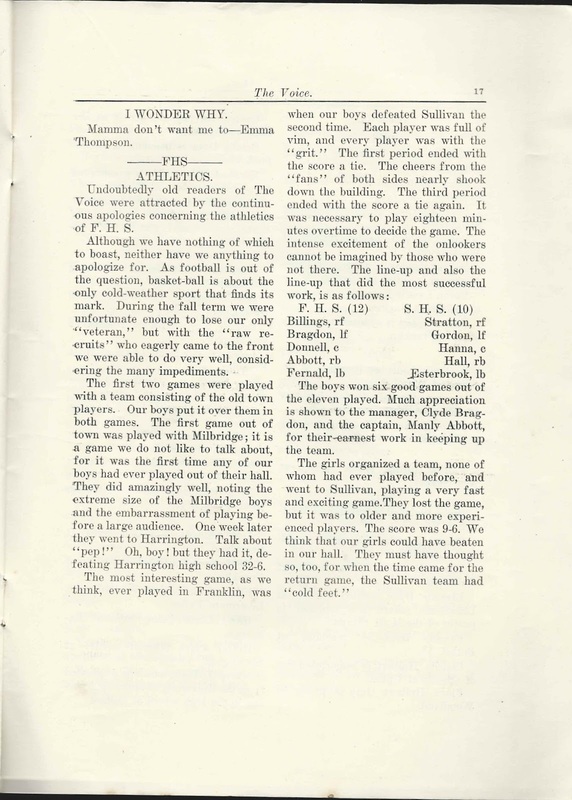 Bear in mind that the dates entered on the Records pages may have been entered by someone relying on memory or secondhand information, so may or may not be reliable. 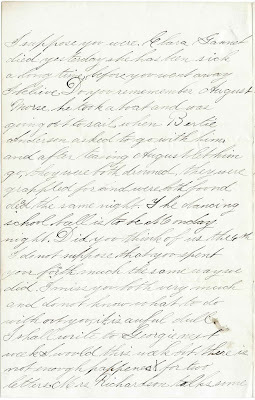 That said, the handwriting is definitely of the style of the early 1800s. 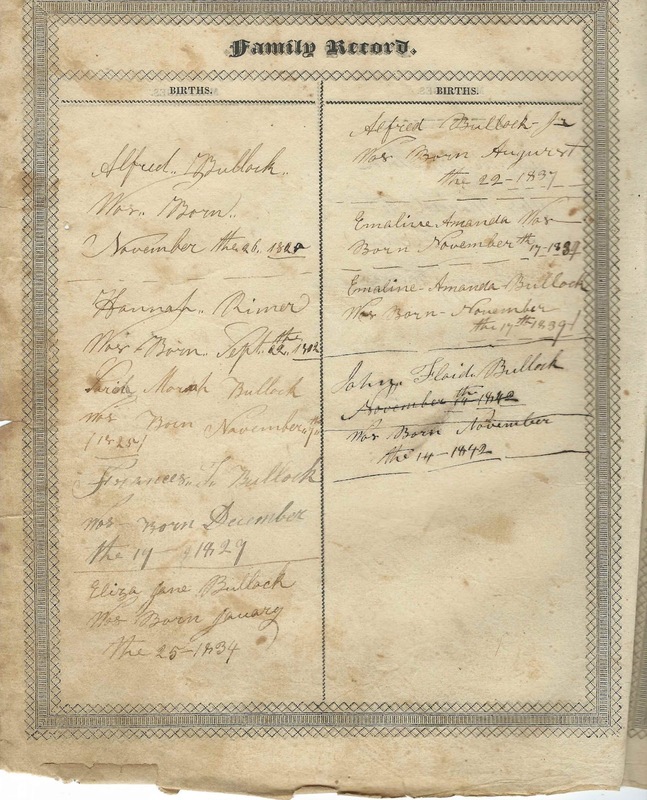 According to information gleaned online, it appears that Alfred and Hannah were natives of the State of New York. They lived in Orange County, New York, for at least part of their lives and are buried in the Laurel Grove Cemetery at Port Jervis, New York. 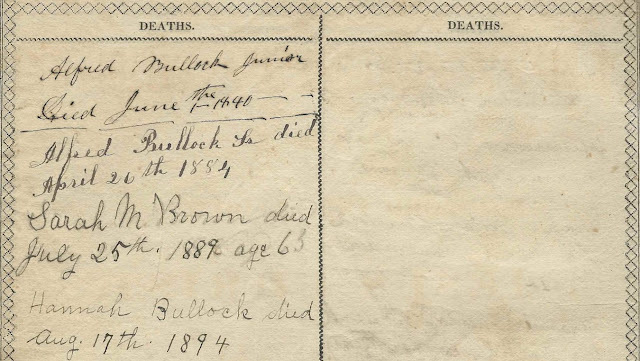 Note: Two different birth dates are shown for Alfred Bullock. 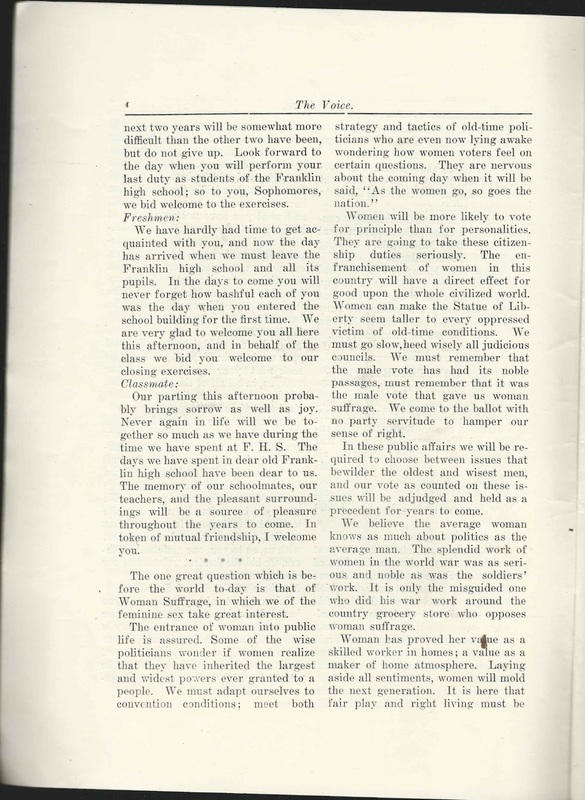 Below, the left of the facing Births pages. 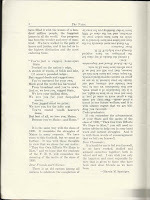 Click on an image to enlarge it. Hannah Rimer was born September 22, 1802. If you have alternative and/or additional information on this family, please leave a comment or contact me directly. 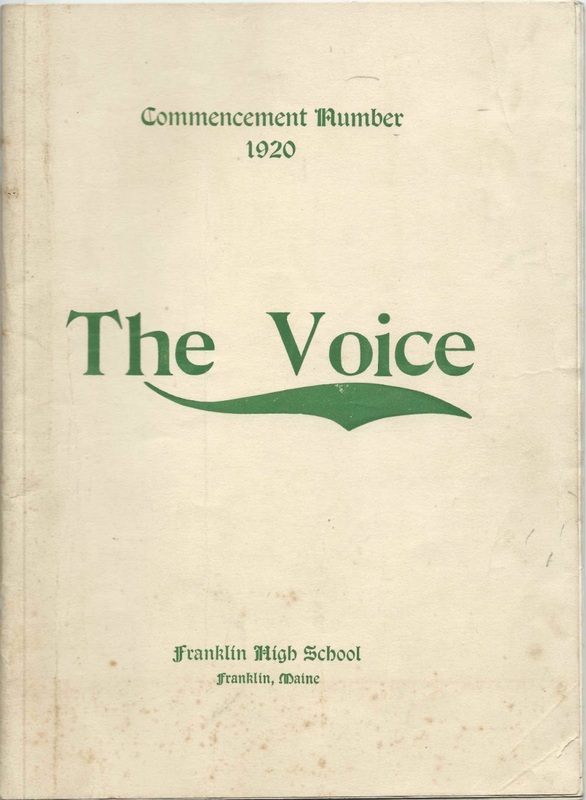 Commencement Number 1920, "The Voice", published by Franklin High School at Franklin, Maine. Reading between the lines, it appears that the class contained only two female graduates; I don't know the number of male graduates, but it appears it was a small class. 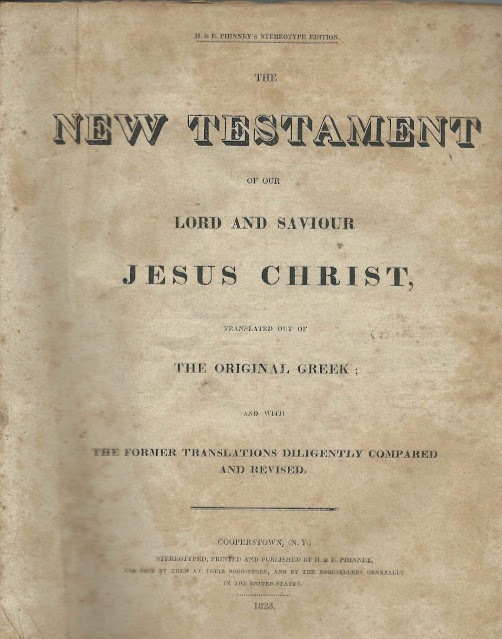 Approximately 10-1/2" by 7-3/4", with 20 numbered pages and several pages of advertising. 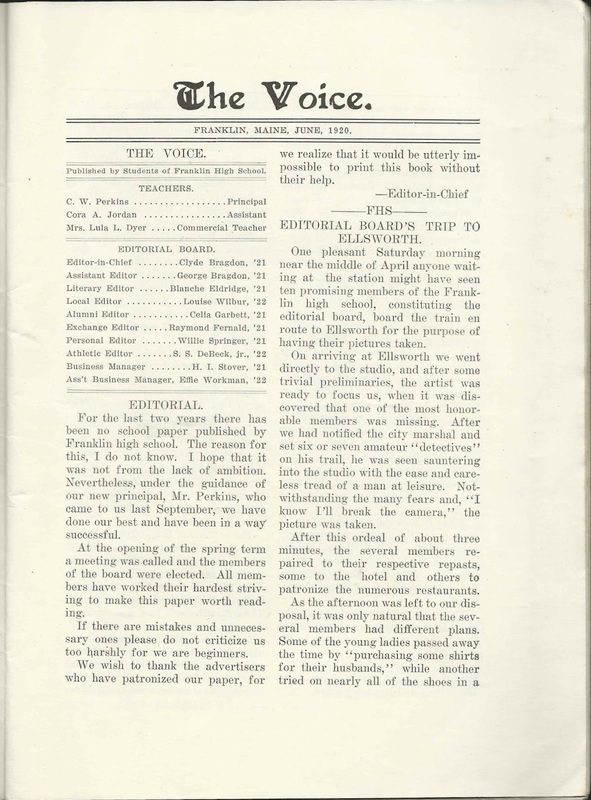 Below, the frontispiece, presumably a photograph of the editorial staff. 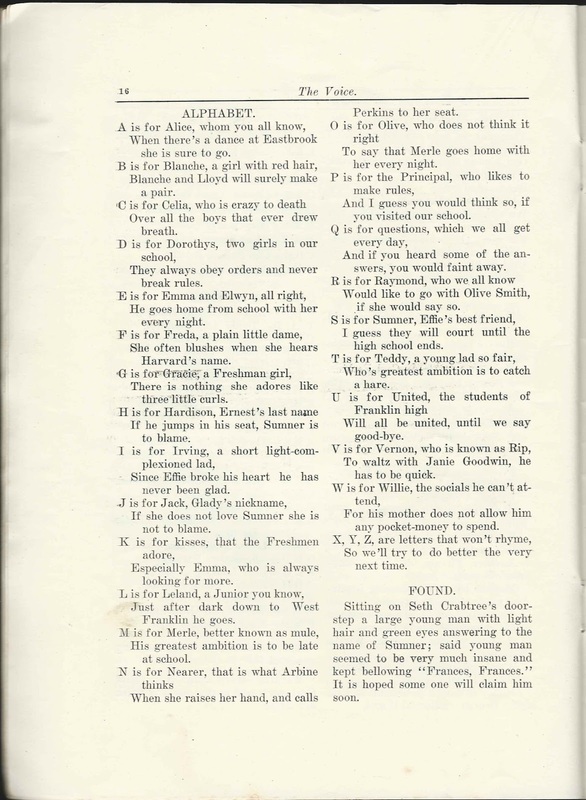 An alphabetical list of the people mentioned in the issue appears near the end of this post; images of all of the pages appear after that. Another photograph, not identified. It can't be of the graduating class, as it's indicated in the history of the class that only two students were there at the end. 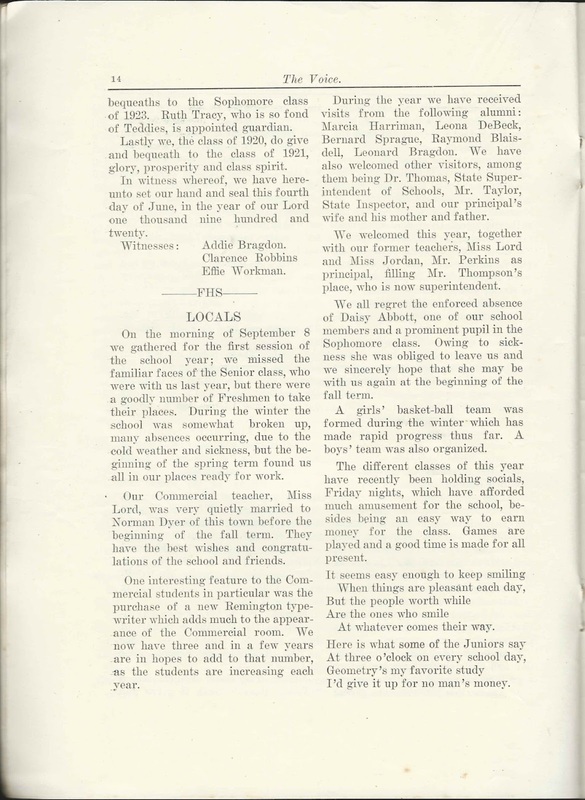 I believe they were Marcia Springer, who penned the Valedictory, and Alice Ryder, originally a member of the Class of 1919, who had had to miss a portion of that school year. 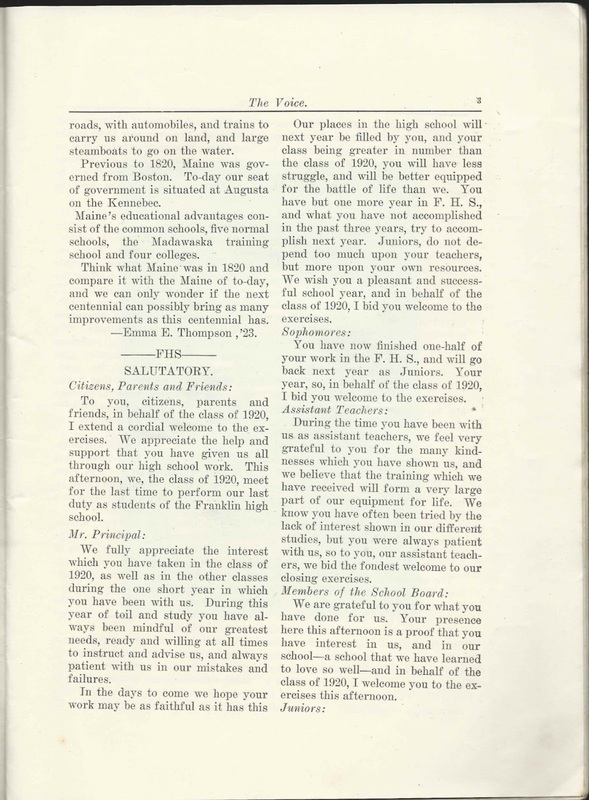 The photograph below might show Principal Perkins, his two assistants and the two graduates, the "band" referenced in the "History" of the class penned by Belva M. Simmons of the Junior Class. 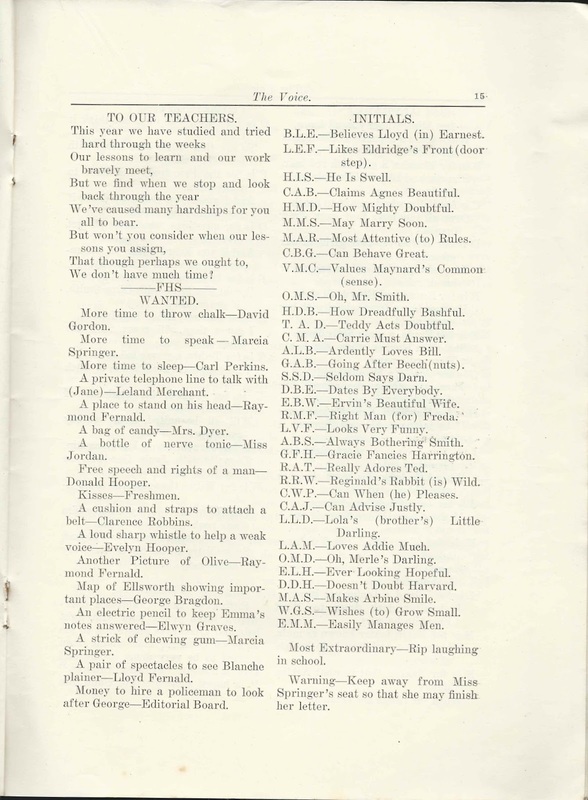 People Mentioned in the Issue - some mentioned multiple times; given names within a surname are not necessarily in alphabetical order. 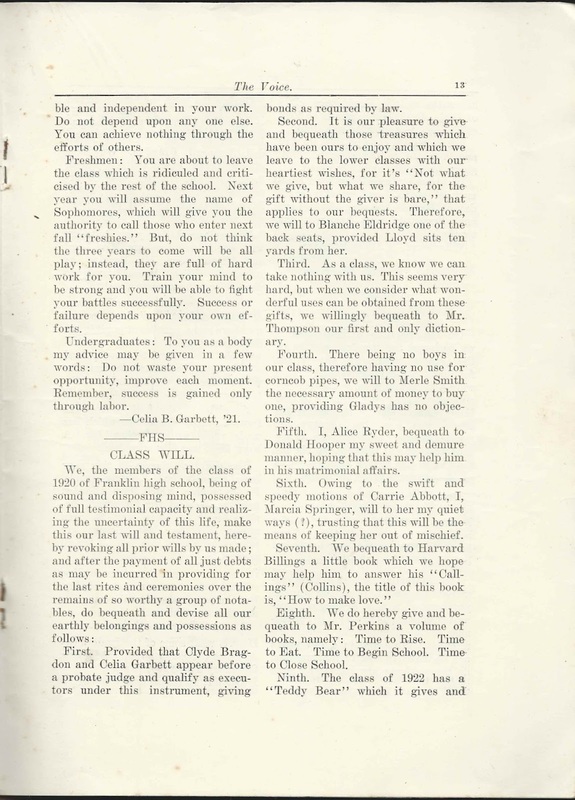 F Raymond Fernald, '21, Exchange Editor Daisy Gordon Taylor, Class of 1908; residing at Washington, D.C.